This topic contains 8 replies, has 5 voices, and was last updated by TheTrivium4TW 1 year ago. Again Keen is correct as far as it goes, and that’s why we haven’t had inflation. If I print billions but hide it under a rock, is that inflationary? But not forever. There are several styles of inflations, created by interactions of the few moving parts (to paraphrase Jimmy Carter). There are war inflations, shortage inflations, and seldom but sometimes, overheating economy inflations. “Inflation” itself refers to the ‘increase-in-the-money-supply’ rise in prices. But “inflation”, as we hear of it, hyperinflation is not these things. It’s total loss of confidence in the government or the government/economy combo. The people repudiate the currency and look for alternatives, leading to bad wrangles with the government. 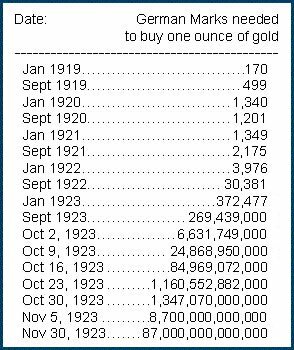 In Weimar, the classic example, the government printed enormous quantities of money with no ill effects for years…until they didn’t. Then suddenly, in a few weeks, what worked for the previous 2 years stopped working before the Bank could respond or figure out why. There’s a Twitter meme on this today I can’t find. This is pretty common of hyperinflations. Seems like today they can stretch them out longer–first in slowing the event, then like Argentina, keeping it going for years, not months. So I’d expect a repudiation of the US$, or even the UK Pound, but not internally at first, and not from the West. From China vs the West in imports, then leading to problems that can’t be contained, finally arriving with the people too. Again, hyperinflation is strangely the LACK of money. Prices rise and people are desperate to get currency to pay bills at the same time. The economy slows and tanks and does NOT increase (opposite of some other inflations) yet import costs and lack of confidence leads to prices and velocity increasing. People trapped in the spiral look for gold, nearby currency (US$ in Argentina), and now cryptos, as in Venezuela today. It ends when the government gives up their bad behavior and allows the free market to work again. Confidence returns, but no one trusts the currency and it has to be backed with something tangible, usually gold (which is an international good). Then the whole thing starts again. Deflation now? Sure. Always? Maybe not. Fiat has always ended in repudiation, but the Core currency is always the last to fail. Steve Keen examines the available data and finds it supports his claim that mortage credit expansion drives house prices rises. I agree with him that it does, and I think I know what the causal mechanism is (as in my recent post to this thread). But why are things set up like that? What’s the motive? It’s this. Credit expansion benefits two groups: banks and debtors. Banks like credit expansion because each new loan issued is money they create out of thin air and add to their books as an asset. Debtors like credit expansion because creating new money (i.e. inflating the money supply) devalues the currency – and with it their debts. This is the crux of the matter: Governments are by far the world’s biggest debtors and they also have the power to set the monetary policy that allows banks to expand credit. That toxic symbiosis between banks and government is the nub of the problem and neither of them is going to change it voluntarily. The problem will be lack of money, even total absence of money in many households. If a deflationary period is severe enough, those without money will find a substitute. Barter presents obvious difficulties as goods’ worths are mismatched, so local, temporary forms of currency will be invented. Unless, of course, a better alternative to the dwindling supply of fiat already exists. Like, for instance, Bitcoin. Which causes me to question whether a deflation can simultaneously be a hyperinflation, as one event, not two separate events. An increasing loss of confidence in the national currency because of its sheer unobtain-ablity. Apologies if all of this has already been written about and discussed; if so, I’ve somehow managed to miss it. Not bothering to cite sources here, but I’ve gotten the impression that the initial replacement currency governments (i.e. banks) come up with often turns out to be a dud. That first attempt at a new currency ends up ruining everybody who accepts it. Currently in vogue with governments (i.e. banks) are the planned blockchain-based replacement currencies, all centralized so as to provide a smooth transition for the currency controllers. New digital currency, same as the old digital currency, but winning acceptance from the ignorant and gullible public by using the magic word “blockchain.” Oh, they’ll work for a while, but all will fail, probably within a few years. In 2003, I told a colleague we’d never in our lives ever see gold that cheap again. I’ve been right so far in that prediction. Well, it’s 2018 now, and FWIW I’m telling my colleagues we’ll never in our lives see Bitcoin this cheap again. If this blog is still up in fifteen years, consider this a warning. I plan to gloat. Clarification: In absolute numbers, BTC might well be cheaper later on, but after factoring in the coming escalation in dollar purchasing power, I’m sticking to my prediction. Steve Keen is clearly controlled opposition meant to make people like Ilargi feel good. I know this will hurt emotions, but the FACTS are clear. The above article used to have comments attached to it. Forbes took them down. In it, Keen has the Banksters making the most money even though they do effectively nothing but key money into the system and call it back in. There was no criticism of this in his article. He’s apparently fine with it. But that’s not the worst part. His depiction of the money system is that of a finite zero-sum game, and it is exactly correct. That’s what a debt-money system is: money assets = money liabilities. Keen’s argument is that there is actually equality between money owed and money available, and in this argument he’s exactly right. But, alas, Orwell spilled the beans. Orwell told us all that omission is the most powerful form of lie. 1. Absolute perfect money flow to debtors before their debts were due (the existence of money isn’t the issue, the availability of money to the debtor in a timely manner IS the issue). 2. The Banking sector has to work with effectively zero net money. Why? If they have a net positive money condition, BY DEFINITION, IT IS EQUIVALENT TO A NET INEXTINGUISHABLE DEBT CONDITION ELSEWHERE IN SOCIETY. In fact, it is much worse than described. Why? Because it isn’t just the banks that have to operate this way, it is the Mega-Corporatocracy as well. Keen was made aware of the trillions held offshore (by definition inextinguishable debt). He LIED and said the facts weren’t accurate, and said he’d devise a more “complex” model (the truth is simple, Keen – 5th grade mathematics… THE LIE MUST BE COMPLEX!). He LIED about that, claimed a new model wasn’t required, declared the debate settled, and moved on. Forbes eventually destroyed the comments section. But Steve Keen makes Ilargi **FEEL** good, so Ilargi won’t go near the tyranny inadvertently exposed by Keen’s little model. Yes, Keen is right there will be a deflation. Keen’s job is to make it look like something other than it is, a systematic military operation being purposefully run by Money Power Sith Lords against their ordinary human prey (oligarchs vs. serfs, same ole, same ole… Keen is just a level of Goebbels*). But when Keen was confronted with the finite zero-sum nature of debt-money in the article I linked above, he claimed that money is not “hidden” and is always available in the amounts needed by debtors.